After launching the HIVE last fall, Dance Source Houston (DSH) and Houston Ballet are pleased to announce three additional dates for Spring 2018. A collaboration between DSH and Houston Ballet, the HIVE offers local choreographers time and space at the Center for Dance to explore and experiment with movement. The program gathers a group of up to 25 dancers, through an open call, to participate in the choreography lab. 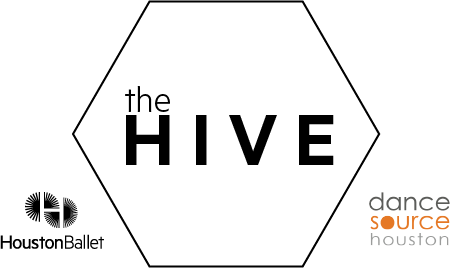 The choreographers selected for the second round of the HIVE are Brittany Bass (April 22), Jacquelyne Boe (March 25) and Lori Yuill (February 25). Each choreographer will use the resources provided to further develop a work in progress. Some of the sessions will be open for nondancers to view the choreographic development process and learn more about the choreographers’ methods. Registration for all 3 sessions is opens February 1 at dancesourcehouston.org/hive. Brittany Bass earned her bachelors degree in dance from the University of Houston. Currently she is a member of Karen Stokes Dance Company and has been since Spring 2014. She is also a teacher with Houston Ballet’s Education and Community Engagement program. Although she has more experience as a performer, she is beginning to dive into her career as a choreographer. Brittany’s choreographed works have been featured in American College Dance Association, University of Houston’s Emerging Choreographer’s Showcase, UH Goes to the Barn as well as Dance Source Houston’s annual Barnstorm Dance Fest. Jacquelyne Boe is Houston based professional dancer, choreographer and educator interested in personal growth and development through arts and wellness. Boe received her early education from the High School for Performing and Visual Arts Houston and her BFA from the University of Oklahoma, where she graduated as the Weitzenhoffer Family College of Fine Arts, Graduate of the Year. She is currently a company member of Frame Dance and Hopestone Dance. Boe has also had the pleasure of working with organizations and individual artist such as Erick Hawkins Dance, Erin Reck, Houston Grand Opera in 2016 productions Carousel, Nixon in China and Faust, Noble Motion Dance, Open Dance Project and Teresa Chapman among others. Boe is a critically acclaimed dance maker that has created a hand full of original works since 2014. Since then she was awarded the Houston Press’ 100 Creatives honor and was a recipient of Dance Source Houston’s Artist in Residence Program for 2015-2016. Jacquelyne teaches a wide range of technical levels and ages for organizations such as Frame Dance, the Hope Project and the Houston Ballet. Connect with Jacquelyne @jackiejayboe and jjboe.com. Lori Yuill is an independent choreographer, performer and teaching artist based in the greater Houston area. She did her undergraduate work at TCU and then moved to Guatemala to perform and teach with Momentum Danza Contemporanea. She has had the great pleasure of dancing for a variety of choreographers including Jennifer Wood, Sara Rudner, Anneke Hansen, Milka Djordjevich, Stephanie Miracle, jhon stronks, and Daniel Burkholder/The Playground. Lori holds a master’s degree in dance from Sarah Lawrence College, and her choreography has been presented internationally in Paraguay, Guatemala, Brooklyn, NYC, DC and Houston. She was a 2014-2015 Artist in Residence at Dance Source Houston and received an Artist Project Grant from Houston Art Alliance to make “The Story of a Space”. Her collaboration with Anneke Hansen, “You’re not here”, was named Best in Show at the 2016 Houston Fringe Festival. Lori is currently on the artist board for Diverse Works and working on a collaboration with visual artists Tami Merrick and Nicola Parente set to premiere in March 2018. This dance is part of her ongoing research into the in-between spaces: the space between narrative and abstraction, between choreography and improvisation, and between performance and rehearsal.